Let’s cut to the chase: you don’t just want a job. You want a job you like. You want a job that makes money–real money, money you can live off. You want a job you can count on, that you know will always be there. You want independence, you want to be challenged, and you want to grow while you work. You don’t want to spend your days sitting in a cubicle or listening to a boss scream at you. We have a formal PAID training program for a select few that want to earn respect in the community. Everybody wants these things in a job, but for some reason, no one seems to think it’s possible. All anyone ever talks about is how hard it is to find a good job these days. If we may be so bold, might we suggest these people have been looking in the wrong place? We get there’s a stigma against plumbing. People tend to think it’s a dirty job that doesn’t pay. A big part of the reason we strive so hard to be the “smell good plumbers” is to debunk these ridiculous myths. 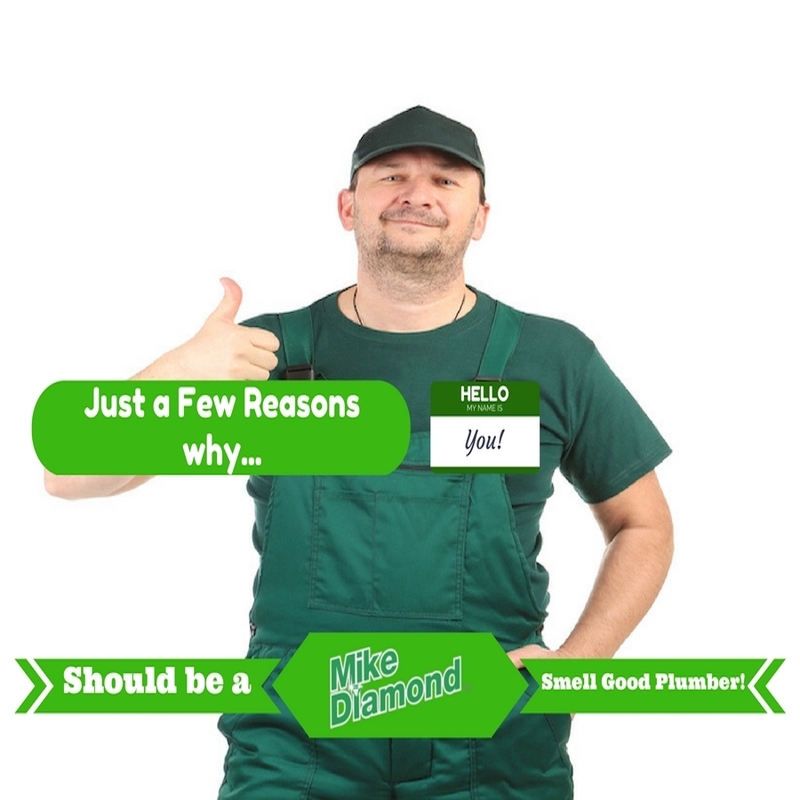 We don’t know about other plumbing companies, but the truth is if you’re looking for a job, you can’t do much better than being a Mike Diamond plumber. Don’t believe us? Give us a chance to prove it to you. Here are just a few reasons why we love our job, and why you would too! We’ll answer your biggest question first: yes, working as a Mike Diamond plumber pays. Our independent, licensed technicians work off a very mutually beneficial commission system. We bring in the jobs, you provide the excellent service. It’s not uncommon for some of our veteran technicians to make six figures! These positions aren’t freelance, either–when you work for Mike Diamond, you get all the benefits of working for a good, strong company. Technicians can look forward to monthly and year-end bonuses, excellent medical insurance programs, and up to four weeks of paid vacation time. You’ll also have access to some of the best retirement support anywhere–we match all employee 401k contributions. 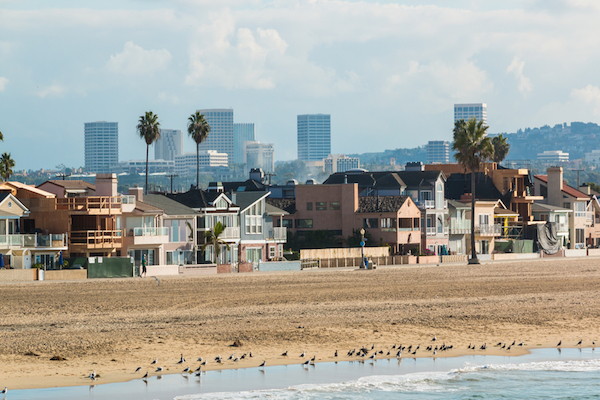 Have you ever wanted to live in Southern California? Mike Diamond provides new hires with the relocation expenses they need to move and settle into a new life on the Best Coast. Once you’re settled, you’ll have a job that provides essentially unlimited earning potential and guaranteed work and job security. Plumbers are always in demand, and when it comes to Southern California, Mike Diamond is the plumber to call. You’ll make wages that will let you live comfortably very quickly upon hire. Also, you’ll spend your days driving around the prettiest place in the country. Which isn’t bad, either. Nobody really likes being told what to do. We might get used to it, but at the end of the day, everyone wants to set their own hours. With Mike Diamond, you can. Since our technicians are paid by commission, you can work as much as you want, when you want. The jobs will always be there. 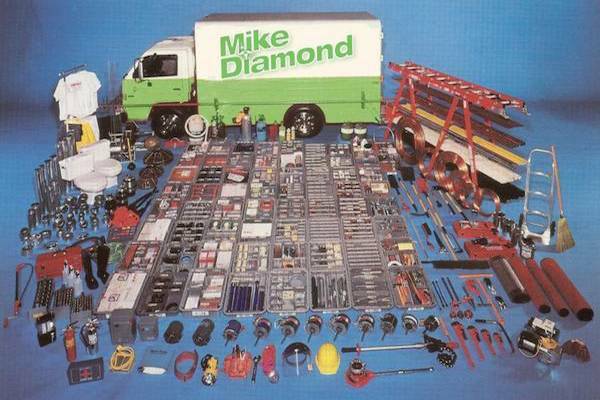 Mike Diamond technicians are provided with their own fully stocked trucks. These trucks are a Mike Diamond signature: they contain everything you’ll need for any job. That means you don’t waste time running to supply houses. 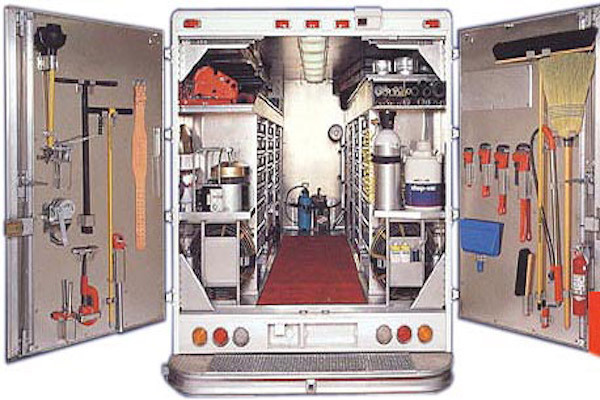 Our technicians are allowed to keep and operate these trucks from their own homes. We equip, maintain, and restock them at your request. Our full-time on-site employees are ready to take your call and provide you with excellent, dependable support while you’re in the field. Experienced technicians are guaranteed a 40-hour work week, and you can also earn overtime for working more. Basically, here’s how it works: We provide the jobs, all the equipment, and anything else you need. You provide your skills and service. We get out of your way and let you do your thing. You smell great. You do a great job. The customer is happy. We’re happy. We pay you. You’re happy. It’s beautiful outside. Even if you’ve never been to LA, we’re guessing you’ve heard legends about the 101. It’s true, the city’s traffic can be brutal. If you’re worried about an insane commute, we don’t blame you. However, Mike Diamond plumbers don’t have bad commutes, because they don’t have to drive into a central location. Our technicians keep their trucks and work from home. They choose a service area they want to cover, and we send them jobs from that service area only. You can always change your service area if you want to move or see a different part of the city. With this system, a lot of our techs work a full week and only ever drive a few miles from home! You don’t have to worry about wasting your time with property management companies or big commercial contract jobs–98 percent of Mike Diamond’s business is strictly residential. The way we see it, the more we take care of our technicians, the better a job they can do. That’s why we provide you with everything you need, and keep you close to your home. We launder your uniform every week, we stock and maintain your truck and tools, and we make sure you have all the knowledge and skills you need to do a great job. You get to learn and grow your career, all while staying local and remaining independent. We’ve said it before and we’ll say it again–people will always need plumbers. Having the skills to provide professional home repair is maybe the best job security there’s ever been. Think about it: plumbers can live anywhere there’s people and make competitive salaries with benefits. They’re always in demand. Mike Diamond provides a better opportunity to get into and grow your career in home repair better than just about anyone else. Our technicians enjoy a thriving, supportive working community with easy access to experts, mentors, and technical classes. We’re committed to helping our technicians be the best they can be. You can even talk to and learn from company founder Mike Diamond himself. Best of all, you won’t just be learning, you’ll be making money. The “trainee with experience” job is available for anyone looking to get into the plumbing industry. We have numerous other positions available for all experience levels, too. Being a Mike Diamond technician isn’t just a job; it’s a career that can last a lifetime. As you work, you get more skilled, you make more money, and you get more jobs. It’s just that simple. The thing that sets Mike Diamond apart from other plumbing companies most of all (besides the fact that we all smell great) is our community. Mike Diamond is known for our excellent customer service and our great, helpful attitudes. We think we’ve earned this reputation because we care about and respect our people. Every aspect of the Mike Diamond business plan reflects how we care: our technicians are local; they live where they work. They provide real, necessary services to their friends and neighbors. We listen to the customer and always make the suggestion that makes the most sense for them. We strive to make sure our employees have everything they need to do their best work. After all, when you’re happy and successful, we’re happy and successful. Plumbing may not be as glamorous as some jobs, but we’re proud of the work we do and it shows. Our award-winning customer service and excellent technicians have made Mike Diamond Services the #1 plumbing company in Southern California. We couldn’t have done it without our team, and we want you to be a part of that team. Join us today to have a job you can be proud of: get skills, make money, help people, smell great! If you’re ready to start your career as a Smell Good Plumber, check out our employment page, call Wayne at (800) 510-1760, or fax us at (310) 838-4327. If you wanna see us put our money where our mouth is, check out some of our customer reviews. When you’re ready, we have the right place for you. We’re looking forward to it!